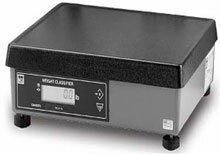 Brecknell 7815R - 150 lb (Remote Display only) with Stainless Ball-top Platter. Includes Remote Display with 7 ft. Cable and Front Mounting Bracket. The Brecknell 9503-17294 is also known as Brecknell Scales	9503-17294	or 950317294	.